Left to right: Scoutmaster R. Kelly Bryant, Jr., Oscar “”O. J.”” Williams, Bruce Caldwell, ? Caldwell (unrelated to Bruce Caldwell), James Morris, Samuel Jones, and James T. Schooler, Jr. 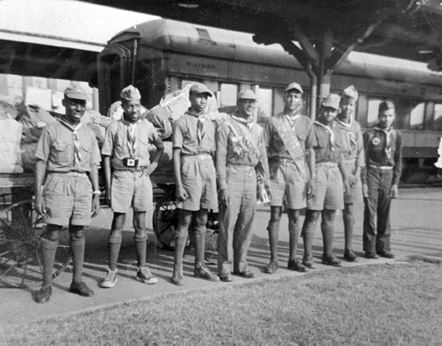 In this 1953 photograph R. Kelly Bryant, Jr., (left) and several scouts are boarding a train in Raleigh for the third National Scout Jamboree in Santa Ana, California. Bryant served as scoutmaster of Troop 187, headquartered at Durham’s Burton School, from 1951 until 1988. He was also Durham Divisional Committee chairman from 1951 to 1957. In his 37 years as scoutmaster, he led more than 400 boys. After Bryant retired from scouting in 1988, Troop 187 moved to Asbury Temple United Methodist Church, then to Ebenezer Missionary Baptist Church. Bryant wrote in 2003 that Durham’s African-American troop leaders “”saw to it that our youths in scouting received a full scouting experience,”” despite the discrimination they faced. In the early years, black troops could not form without the consent of white scoutmasters. Through the 1930s, black scouts could not wear their uniforms in downtown Durham. When Bryant began leading Troop 187, it and other black troops were not recognized by the Boy Scouts of America, and Durham’s African-American scouts could not use the council-owned Camp Durant. Instead, Bryant’s troop used state parks for their outings. While white troops were organized into districts, black troops were organized by division, with no connection between the two. For a number of years African-American troops were not represented on the executive board of the Boy Scout Council and were not invited to participate at annual recognition dinners. With the persistence of people like Bryant and Troop 55 leader Nathaniel White, scouting in the Occoneechee Council in the Raleigh-Durham area became integrated in 1964.